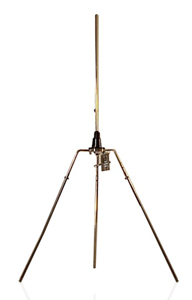 The LGP-FM is an omni-directional ground plane antenna intended for outdoor broadcast applications. It is factory tuned to 97-102 MHz. The center element and ground radials can be extended (for lower frequencies) or retracted (for higher frequencies). The center element and the 3 ground elements must be the same length to ensure proper match. •	Standing wave ratio : 1.5:1 max., 1.2:1 typ. •	Wind factor handling : 80 mph (130 km/h) max. •	Weight : 4 lb.